New York City is a dazzling place, home to exciting, diverse neighborhoods and an iconic skyline. You'll find some of the world's top museums and landmarks and yes, the nation's top diamond district. Traversing the Diamond District can be a very taxing experience. It is, unfortunately, notorious for touts and hustlers. Many shoppers feel completely overwhelmed and "preyed upon." But it is possible to find your perfect engagement ring there too. You just have to know what you're doing, so that you don't get ripped off. We hope this guide will help you have a good, memorable experience. The world-famous New York Diamond District is made up of just one city block, yet it's a major financial powerhouse for the State. That's a lot of money packed in a tiny amount of space. On the bustling West 47th Street between 5th and 6th Avenue in Midtown Manhattan (just a stone's throw from Times Square), you'll find over 2,600 jewelry stores selling everything from diamonds, gemstones, fine jewelry, gold, watches, to estate pieces. Some are individual stores and some are in large exchanges where up to 100 jeweler counters compete for attention. The diamond district wasn't always on 47th Street. 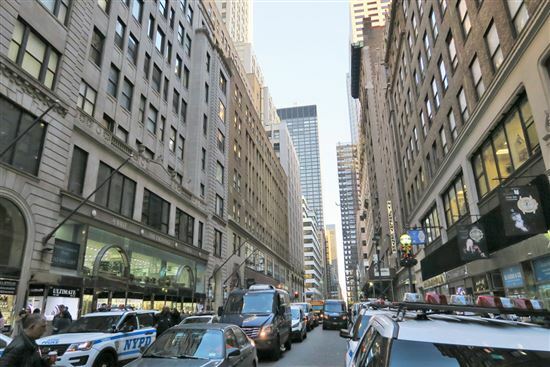 It was originally located on Maiden Lane (fitting name) in the heart of downtown Manhattan. However, in the 1920s, as that area emerged as a financial center, the rent also started increasing. 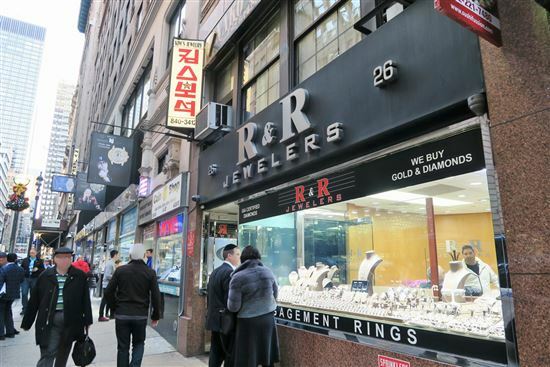 Eventually, it got too expensive and the jewelers found a new home on 47th Street. It really blossomed in the 40s when European Orthodox Jews fled to New York during World War II. Many were in the diamond business. 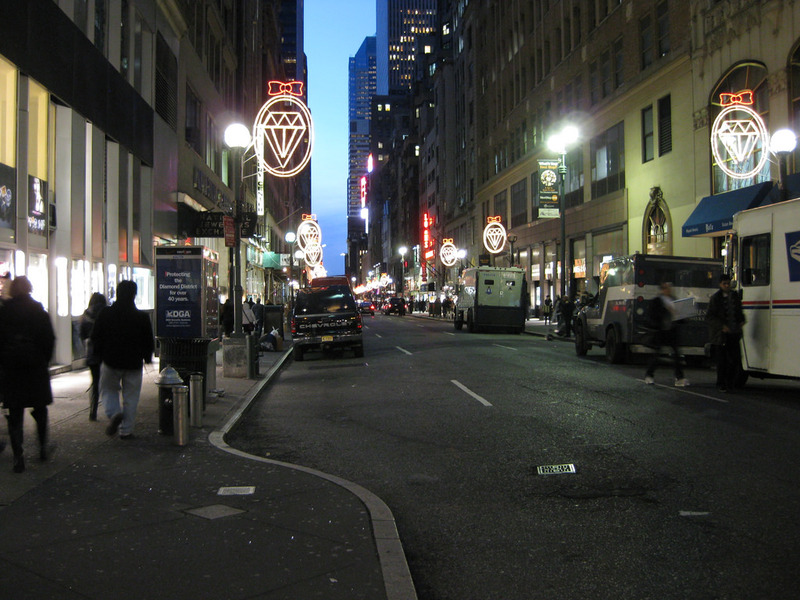 Most settled on 47th Street and thus, the Diamond District was born. Even now, you can find the descendants still working in the district. Today, the New York City Diamond District is the gateway to the world's largest consumer diamond market. About 90% of the diamonds imported into the U.S. pass through it first. Diamonds are the State's largest export and the district alone generates over $24 billion in annual sales. 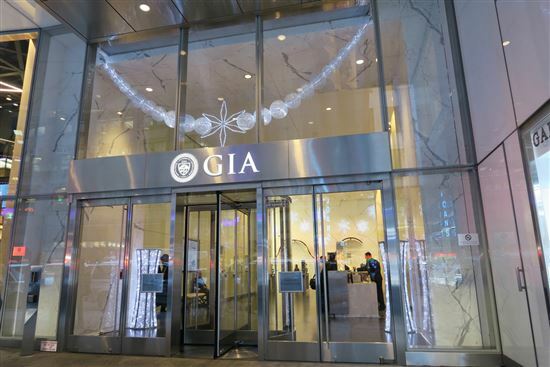 The GIA lab (Gemological Institute of America) in New York is also located right in the heart of the district. 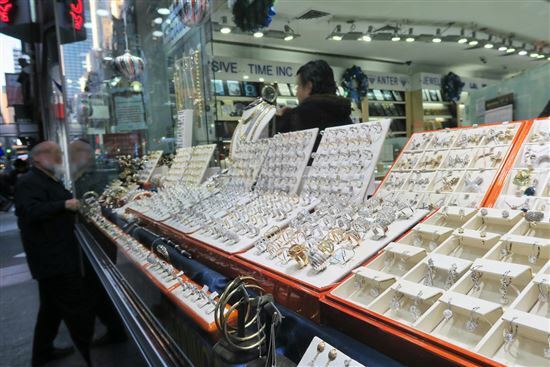 Did you know: NYC's Diamond District is unique in that it caters to both consumers and wholesalers. Most major retailers get their jewels through the district. It's also home to the Dealers Club, which is the largest diamond trade organization in the U.S., as well as one of the biggest exchanges in the world. 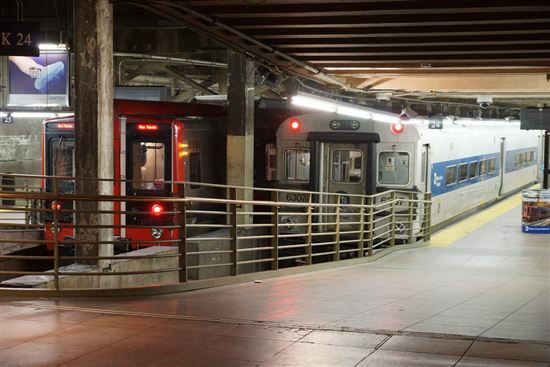 NY subway: When in New York, you've got to take the subway. The closest subway stop is at 47th-50th Street - Rockefeller Center via the B, D, F or M train (please note that B & M only run on the weekdays). This stop is just 2 blocks from 47th St. & 6th Avenue. Before heading to NYC by car, use an app like Best Parking to find a structure and reserve your parking spot. The New York Diamond District can feel very intimidating. As soon as you walk in, you're overwhelmed with sparkly window displays housing hundreds of rings and other jewelry. Salesmen may approach you and persuade you to come in and "take a look." It's easy to fall into the shopper's trap. There's no harm in looking at some diamonds and trying on a few styles, but make sure you have a plan. The number one rule is to show up prepared. You don't have to be an expert, but if you sound like a total newbie, you may as well have a huge red target painted on your forehead. Research pricing online first. Even if you know you want to buy your diamond in person at a store, start your search with online retailers, such as Blue Nile and James Allen, first. Play around with different settings for each of the 4Cs to get an idea of how much a diamond costs with different characteristics. Know where to go: Generally speaking, the shops closer to the 5th Avenue side of the Diamond District are higher in quality. The 6th Avenue side has more flashy exchanges with dozens of jeweler counters. Be cautious. In general, we don't recommend buying from jewelers who only show you complete rings. You want to be able to compare loose diamonds. Instead, look for small mom and pop stores. They're usually located higher up above street level in high security buildings. These jewelers are usually by appointment only, so do your research beforehand. Learn about the 4Cs. It's important to know a little about what drives diamond prices. This article is a good place to start. We break down each C (carat, cut, color, and clarity) and show you how they affect the beauty and price of the diamond. Some C's aren't as important as others, so there's no need to overspend. Tip: Clarity is the least important of the Cs. There's really no need to go above VS2. At this grade, you can be confident that there are no flaws visible. An SI1 diamond is even better value if you can find one that's eye-clean. James Allen and Blue Nile are both great places to start to get a feel for the diamond prices you can expect. 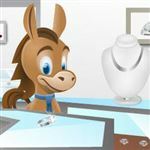 Before visiting a local jeweler, we recommend checking prices online. Two trustworthy retailers are Blue Nile and James Allen. This bit of research will enable you to have an idea of how much you want to spend before setting foot in a store. The good shops are the ones that'll spend the time to understand your budget and style, compare diamonds with you using professional tools, and won't pressure you into making a purchase. Designs by Kamni: Kamni enjoys connecting with her customers and helping them design the perfect custom ring within their budget. What makes her stand out is that she takes the time to educate her customers, so that they feel completely comfortable with the purchase. She also handpicks each diamond herself and all her stones are conflict free and GIA certified. R&R Jewelers: This family-owned store by brothers Rami and Robert has been in business for over 30 years. Their goal is to make each customer feel valued, appreciated, and acknowledged. They have a large inventory of handpicked loose diamonds and designer jewelry, and they are also happy to do custom designs. Ben Moses Jewelry Designer: Now a father-son duo, this store is three generations of jewelry and ring design that started back in Europe. They are talented designers and take pride in their craftsmanship to make unique rings for customers. If you have very specific or vintage tastes, they might be perfect for you. Sashka Jewelry: Owned by Issac and Gina, a husband and wife team, this small store provides a comfortable and welcoming environment for customers that's free from pressure. They also have a large assortment of other gems if you're looking for something other than a diamond. Jangmi Diamonds: Easily the most popular store in the New York Diamond District, this store deserves the hundreds of 5-star reviews it has due to over 30 years of trust and credibility. The Kims and their staff are all highly knowledgeable and patiently help customers find their dream ring. All their diamonds are GIA certified. The New York Diamond District can be described as a high-pressure zone. You'll see a lot of salesmen out on the sidewalk trying to lure you in to show you their "great deals" and "low prices" on diamonds. Don't get pressured into making a purchase. If you feel uncertain about a diamond or the price, that's not a good sign. If you spend some time learning about the 4Cs, though, then you'll have a better idea of what to expect. If you're at a store and feel like the salesperson is pushing the hard sell or is using shady tactics (be on the lookout for things like "This awesome deal only lasts today" or "Normally the price is $XXXX, so I'm giving you a good deal! "), then walk out. You should always feel comfortable and happy about the purchase. Plus, deals on diamonds don't exist. Ask to examine the diamond. A good store will let you examine the diamond with a professional jeweler's loupe and even light performance tools. If a store does not let you examine and compare diamonds, or claims that a diamond is high-quality without offering any proof, that's not good. Take your business to another store that's upfront with their information. Make sure you get a certification from a reliable lab. We recommend only buying diamonds with a GIA or AGS report, as these are the two most reliable labs . 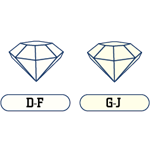 Other labs may not grade to the same standards, meaning a diamond graded as having a color of H by one lab might actually only be a J when rated by GIA or AGS. Understand the store refund policy and warranties. A lot of stores offer a full refund within 14 to 30 days. But some stores may only offer store credit (which is pretty much useless because you wouldn't spend money there again if you didn't like what you got the first time around). Be very, very clear about the store's policy before handing over any money. Also, ask about their other policies such as warranty and diamond trade-up. Use a credit card for purchase protection. Of course, you shouldn't charge the ring if you don't have the cash. But a credit card does give you certain protections if the item you received is not what was promised. Get a receipt and have all agreements and policies in writing. This is very important. After you have made a purchase, make sure the receipt clearly states the store name, address, the item (including details of all the Cs), purchase amount, and the date of purchase. In addition, you should have the store rep write down all verbal agreements and the refund policy, just in case a less-than-reputable store tries to go back on its word later. It's important to get the 4 C's (carat, clarity, color, and cut) in writing. Even better, if the jeweler can go over the flaws with you and plot them on a clarity plot. This acts as a "fingerprint" of the diamond. It's important to get all this down so that you are protected in case a jeweler tries to do the ol' switcheroo. This way, when you go back to pick up the finished ring, you can have the jeweler examine the diamond with you again, and match up the flaws. If a jeweler refuses to do this, then don't do any business with him/her. Finally, here are some lingo you may hear buzzing around the New York Diamond District. Familiarize yourself with them, so you don't fall for any shlok (or junk). Fancy yellow diamond scams. Are you looking for a yellow diamond? You can easily be duped on the color. Yellow diamonds (commonly called canaries) are naturally colored and are rarer than white (or colorless) diamonds. But watch out, not all yellow diamonds are a true fancy-color diamond. Yellow diamonds have a different color grading scheme. They're graded as: Fancy Light Yellow, Fancy Yellow, Fancy Intense Yellow, and Fancy Vivid Yellow. Colorless diamonds, on the other hand, are graded from D to Z. The lower the alphabet means the more yellow a diamond is. A sneaky salesman may try to sell you a low-colored diamond and say it's a Fancy Light Yellow diamond. You may hear the term "fancy" and be fooled into thinking it's a rarer yellow diamond, when it's really a low-colored white diamond. This makes for an easy scam. If you are buying a fancy colored diamond. Make sure it is natural. Don't be fooled like this girl who was scammed into buying an artificially colored pink diamond at the NYC Diamond District. Back alley and estate diamonds. These are diamonds sold on the secondary market (estate is just a fancier-sounding name). In other words - someone else owned it. Maybe this doesn't bother you, but you should know its origination. For example, was it stolen? How many people owned it? These are just a few questions that pop in my head. Single cut vs. full cut. Single cut diamonds have 17 or 18 facets (as opposed to the normal 57 facets), so they are not nearly as brilliant. Small side diamonds (or melees) are often single cut, because they are too small. If your center stone is single cut, though, you will notice a HUGE difference in brilliance. Also, don't be fooled by elegant sounding terms like "Old European cut" or "rose cut". These are all vintage cuts from old techniques. They have less facets and don't have the ideal proportions for maximum brilliance. 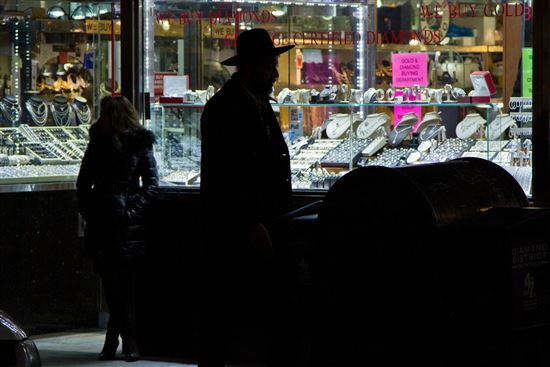 Tip: If you are looking for true antique jewelry in the NYC Diamond District, don't be fooled by these terms and scammers. Check out Stephan Herdemian Antique Jewelry. They sell true antique, art deco, and Victorian jewelry (not reproductions). Avoid hawks. These so-called salespeople try to sell you deals that are too good to be true. Some may not sell diamonds directly, but try to convince you to visit a specific store. In exchange, the hawks get a small commission if you purchase the diamonds. The police are cracking down on these salespeople, but you will still find them throughout. They're more prevalent on the 6th Avenue side. Spread stones. The diamond dealers know people want a large-looking stone at the best price. That's why you must watch out for spread stones. This means it is cut shallower (larger width and smaller depth), so it looks bigger face-up. A one-carat spread diamond may look as big as a 1 ¼ carat. So you think you're getting a great deal. But watch out: diamonds that are cut too shallow just means poor cut. They don't reflect as much light, so they look more dull. But the term "spread" sounds better than poor cut, right? Don't be fooled. The Fake Diamonds. If you hear the term doublet, don't think you are getting something special. A doublet diamond is actually not a full diamond. Dealers glue the top of a 'real' diamond to another stone (usually a cubic zirconia) to make it look whole, and then sell it for much more than it's worth. To spot a doublet, look at the girdle (the edge that divides the top and bottom of the diamond). A distinct line will tell you that you have a doublet. Make sure you examine it with a jeweler's loupe. Grade bumping. The Federal Trade Commission legally allow jewelers to be off one grade in regards to color or clarity. As you can imagine, many jewelers take advantage of this to bump up the grade of their diamonds (even up to 2 grades). This means they can sell a diamond for much more than it's really worth. This is why you should never buy a diamond without a lab certificate. We only recommend getting a diamond certified by GIA or AGS. It is more expensive to obtain a report from these labs and their grading requirement is the most consistent and stringent. Serious high-quality jewelers will know to only use them. Clarity enhanced diamonds. This means that flaws have been manually removed. The most common method is the laser drill. It means the diamond had some type of flaw that the dealer drilled out and filled. This makes the dark impurity disappear. However, this may make the diamond weaker. And also makes it worth less. But a scammer could try it sell it to as a higher-clarity diamond. Color enhanced diamonds. You can actually turn a yellow/brown diamond white by using a high temperature, high pressure (HTHP) treatment. Again, this makes the diamond more brittle. And you're paying more for a low-quality diamond. The Federal Trade Commission requires that any artificial enhancements be disclosed on the report. This is another reason why we only recommend you buy GIA or AGS certified diamonds. We listed some of the lingo and scams here so you'll know how to fall for it. Unfortunately, in the New York Diamond District, scams abound. Remember, work with a jeweler who will let you examine the diamond yourself with a loupe and go over any flaws with you. The jeweler should also be happy to weigh the loose diamond in front of you and show you color comparisons. If a jeweler refuses to do any of that, be careful. If you're not careful, the New York Diamond District can be an overwhelming and stressful place, seemingly designed to ensnare shoppers with its glittery web. But it's also a place rich in history and could be a fun experience. We cannot stress it enough: research, research, and research. Learn about the 4Cs and diamond prices, and read the reviews of stores you may want to visit. Just remember, you should feel comfortable every step of the way. Don't ever feel pressured. If a salesperson is making you tense, just walk out. There are hundreds of other stores you can visit instead. We gave you a good starting point in our shortlist. 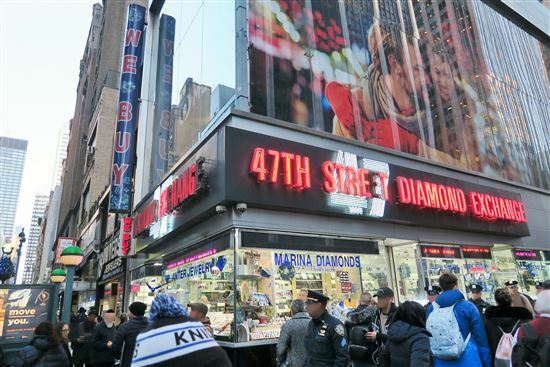 Share on Facebook "How to Get the Best Deal at the NYC Diamond District"